When the wind blows....My kite goes! I have Rush IV Pro 300 at home. If it's the same I can check it and make pictures of the handles for you later today. If it is just the one of the flying lines, the lines just need to be equalized (made the same length), resleeved and reattached to the control bar/bridle leaders. The HQ sleevings are stitched so they need the sticthing removed with a needle or seam ripper. 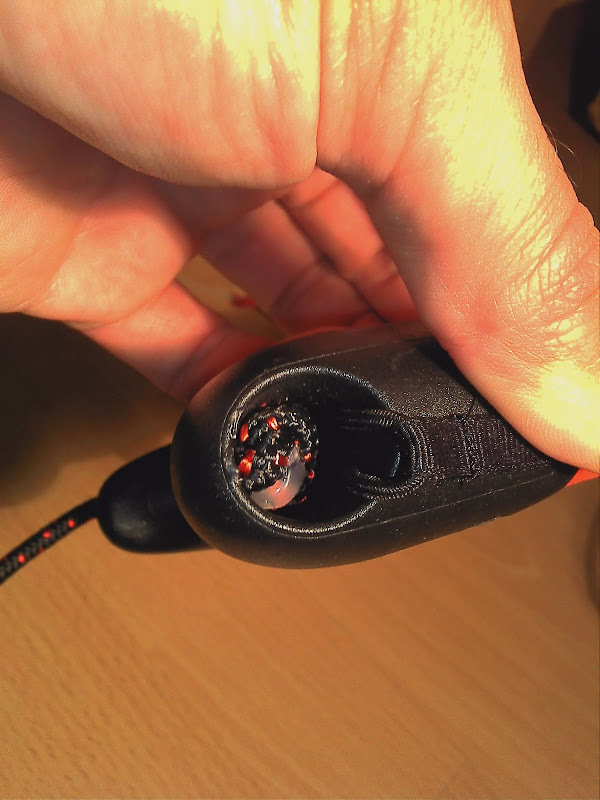 Once the lines are equalized, you can restitch or use locking knots to keep the sleeving in place. Sleeving kits come with a sleeving tool to guide the flying line through the sleeving, but any stiff wire (piano wire, heavier gauge guitar strings, etc), that still passed through the sleeving, will work. 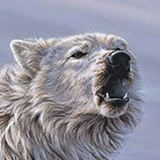 If you can post pics of the damage, it will help. Let me know if any of this is unclear. Sorry for not replying sooner but the I didn't have the kite at home after all. Here are some pictures of the lines coming from the handles. This photo shows how the middle line is attached. The lines are sleeved at the end and a loop is made for connecting to the leaders. Again, this is the middle leader connecting to the middle line which connects to the brake. 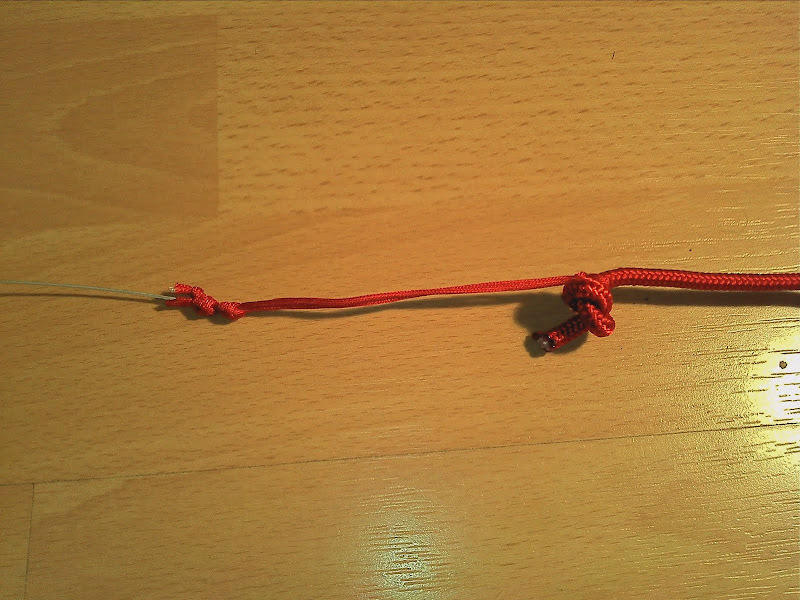 Loops made at the end of lines are roughly 8cm long knot to knot or 11 cm is the visible length end to end of the sleeve while it's attached to the leader. Also, as you can see the leaders have a simple overhand knot at the end to allow for easy attachment of lines. This photo show the bottom of the handle. 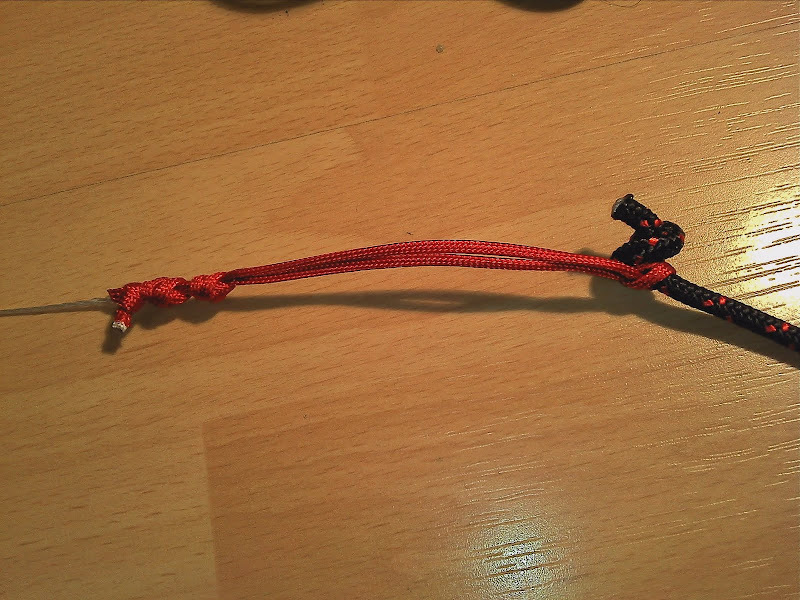 Leaders are attached by feeding them through the hole in the end of the handle and tying a simple overhand knot. At HQ they also added some melted silicon glue or what's it called to keep it extra secure. The leader s then fed through another hole in the line winder part of the handle. The place where the line touches the handle at the very end is from where I took measurement for this leader length. It's roughly 77cm. This is the left line attached to the left leader (red). It's the same as the middle line except that the leaders are color coded. Blue/Red. I also made a picture of the stopper ball on on the middle/brake line. There are 2 of these balls on either side of the handle. 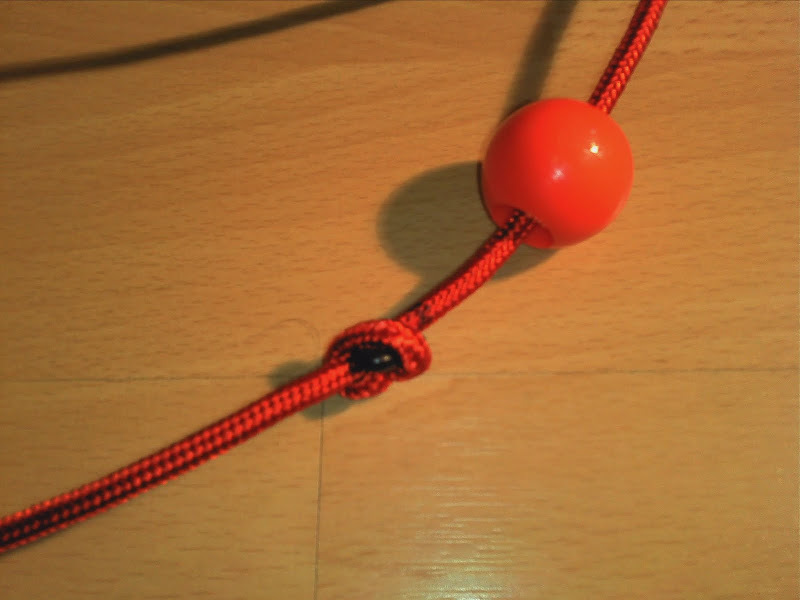 Both are stopped by a simple overhand knot at the right place. The black thing in the knot is a rubber ring they added to make the knot more secure. 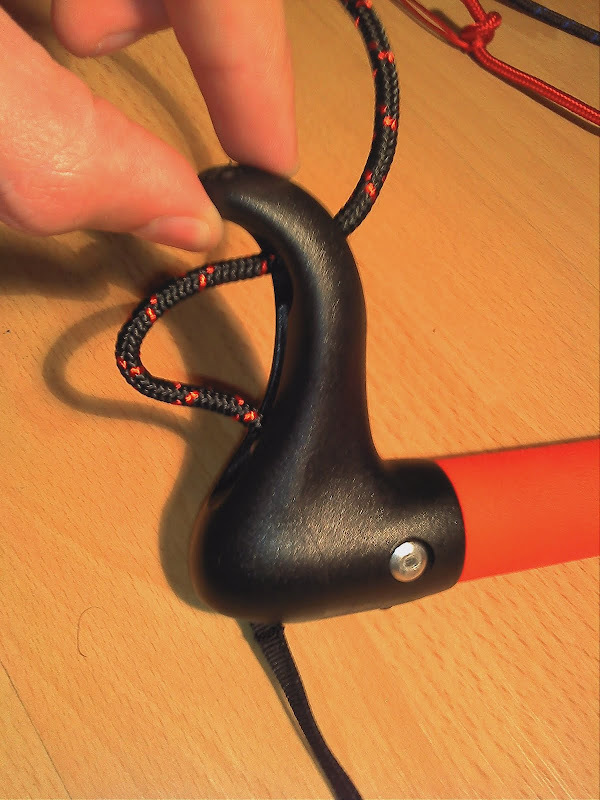 The middle line is roughly 81,5cm long from the attachment knot to the handle. If you broke the actual lines my best advice would be to measure the one that is still intact and replicate it. All 3 lines should be the same length unless I am mistaken. Hope any of this helps you.